Three Column Template in Three Steps. ~ The Blog Doctor. You are here: Home > Three Column > Three Column Template in Three Steps. Three column templates are popular because they make more use of the screen real estate. Adding another column to your blog enables you to add more widgets or advertisements to your blog. 2. The Blogger Dashboard page opens on successful login. 3. Click the Layout link under your blog title. 4. The Page Elements subtab of Layout tab will open. 5. Click the Edit Html subtab of Layout tab. The outer-wrapper is the red column containing the main posts column (blue) and the yellow original sidebar. Space has now been created to add a third column. SECOND : ADD THE CSS CODE. This is the same code as the original sidebar. To differentiate it we have added a 'L' after 'sidebar-wrapper'. It has the same width. Since we want it to be on the left of the posts column we have changed the float property to be '$startside'. Since Blogger has enabled support for bidirectional languages the float:left and float:right have been replaced by $startSide and $endSide respectively. THIRD : ADD CODE IN THE PAGE BODY. You can also make a Three column Classic Template. 157 VIEWERS CLICKED HERE TO COMMENT ON THIS POST. ADD YOUR COMMENT. Hi, Vin. 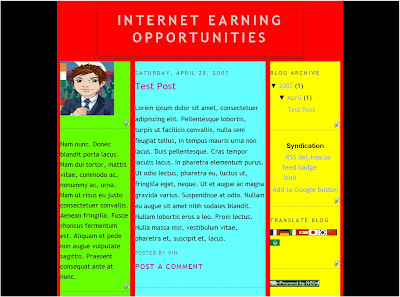 I've been using a three column template since several months, following similar instructions from your blog and others, but since a pair of weeks I've begun to have problems with the layout page to modify the design of the blog: there is no horizontal bar and I cannot access the third column widgets in the right. It happens only with FF but it works ok from IE. ¿Is there any other thing we should change to make the layout page works? Fix the Page Elements Layout Editor. Thanks, Vin. I hadn't seen that other post. Hi, I find that the left column and the main content are too close. Is it because the main column also floats from $startSide? I liked the three column template post. I'm not good in handling blogger beta templates but would like to learn. Thanks for the useful post. Hey Vin, i followed your instructions to add a third column but in the end, the third column was not added and i just had a space between the original sidebar and the main-wrapper...can u tell me where exactly i should paste the CSS code? Put temporary borders on your columns to visualize them better. I followed the procedure for the three column template but I can't post on the middle column and a text appears at the top most portion which is supposed to be in the html layout. If you would be kind enough to visit my site so you can see what is wrong. I thank you for doing this for free as I don't have budget for this. Thanks, the text was gone , but how can I post in the middle column? It seems they all go to the left column no matter how much space I add. Easiest method is to load a three column template and then customize it. Thank you very much for your step by step hint. It is so handy! As for Fixated, I think his/her problem is that he/she did not remove the 00 in the second step, after the 3 f (background line). First, thank you for your blog, its amazing!
" between b:skin CDATA and b:skin tags in the template"
But...where between those tags does it go. Above what, below what. There are a lot of things in between those two tags (in my template, anyway). in the Template Code box. This is my third attempt to leave a comment/question. Here goes...I followed the instructions on the three step column and it worked great. No other sites or information was as easy to follow or did not come up with error messages. Increase width of outer-wrapper by same amount - 10px. Thank you for the help, but you did not address the first part of my question regarding moving the columns around. I used color examples based on your example. But, basically I want my post section (column one), swapped with the profile column (column two). Just like in your example. In the <body> sectin of the template put the code for the profile column before the code for the posts column. It will work provided both have a float:$startside or float:left property. Thanks again Vin. I did what you said and changed both to float:'left property'. The profile column is now able to move where I want it, but the Blogs are now below the profile section. What next. Oooh! I'm old, and a complete idiot but I was able to figure this out! Thanks for the clear explanation. I just added the third column successfully, but not when google indexes my pages, it shows the text in the left column on not the text from posts. How do i fix this? Where did you see the text in the left column being indexed by Google? one other thing, on the page layout editor, i have the blog posts box in the middle, but it creates a second blog posts box in the bottom of the right column, even though it doesn't show that on the actual page. The search robots start indexing from the top of the page. Since the left column usually comes first in the code it is indexed first. That is why my posts column is the leftmost column. To see exactly which of your posts is indexed add blog to Google Webmaster Tools. Can you give the link to a screenshot since we cannot see your Layout editor. Look for '$startSide' in your Template Code box and replace it with 'left'. Add some dummy text to Html widgets in your left column so you can see it. Also add temporary borders to columns to see exactly where they start and end. Remember to increase width of outer-wrapper by same amount as extra margin. I've tried all afternoon ( which I really don't have that much time to mess with this) trying to get the third side bar on my blog. i finally created a new blog in case I messed up. I never could get the thrid side bar on my blog but when i went to my new blog and did what you said it worked. So what is up with my old bolg, do you think is a classic blog. I have layout on there. What is your blog address? That is the CSS part of the template. It should go inside the <body> at the appropriate place. See Step 3 in the above post. I can see the posts section. It is in the middle. Try clearing the cache. hey vin,thanx for replying me so early...i hhave some silly doubts dont mind!!! 1)when i post something i dont want to get the whole post in the same page...i want it to be cut shorted and want to have a small link down to "read more"...how can i do that? 2)i got the menu bar in my blog...its good....but i want to post in that certain label....how shud i do it?cant i post them directly?or if i have to post first in the main blog..can i hide that posts? plzz try to give the reply!! How to Change Post Order? How to Change width of blog? hey vin,thank you once again....i tried the form builder...for registration....i want to have a neat and complete procedure....can i have my blog as a website...i.e., "sign in" and "register"....i tired that but i was confusing,.,,,can u provide some easy procedure.....??? Have a look at Moving from subdomain to your own domain in Blogger. How to Customize the Blogger Template? You can use the Rounders Three Column Template Mod. Is there a way I can fix it? Awesome! Thank you! This worked like a charm. My outer wrapper is already 745 can i still make 3 columns or not really? Sure, you can! You can also increase blog width. If necessary you can try a Fluid width Three Column Template which resizes according to monitor resolution/width. Hi vin!! I v tried to follow all your instructions,+ i read your answers to the comments to try to solve my prob but i can't get it done,, my template is not an original template from blogger so i can't find all the same codes which you described!! Could you please have a look at my blog webpetition.blogspot.com and let me know if there is a way for me to solve that matter!! Your template is not correct. I can see template code at the top of your blog page. Suggest you load a blogger template turn it into three columns and then modify it to look like the template you want. The new sidebar was go down to the bottom and it get slower when we use Opera browser and IE... How can it be fixed? ?How can that happen?? Have a look at Why my sidebar keeps falling down? There are many graphics in your blog which may be slowing down the blog. See How to Speed up Blog Loading? I tried your code and it seems that my blogger is putting a page element on top, of the blog posts, can you please take a look at my blog at DoubleAStudios.com, I cant seem to get that left sidebar to appear on the left of the blog posts instead of how it is now on top of the blog posts, so I can drop gadgets in it. On top of your posts is the menubar. Hi Vin...thank you for responding to my question.It worked! Hey Everything worked out nicely after I learned how to adjust the margins, thanks alot Vin! I had one question though, My blog post were appearing lower than usual, and It seems that when the share (gray) box of a post begins only where the end of the sidebar begins, How can I fix this so I can add more widgets to the sidebar. With the first post not exceding where the end of the sidebar left off. Thanks in advance Vin! The grey box is your post footer. It is there in every post. It is not related to sidebar. Then Y does it begin lower then the sidebar, it is like they are connected.. I am using Firefox 3 and I can't see the problem. Can you provide the link of a screenshot picture with red arrows pointing to the problem? Hi I'm having trouble with the screen shot, but if you go to my blog and click a "topic" you can see more how the footer of the post is dragged to start beginning pairelle of the end of the left sidebar. If u still need a screen shot how can I get it to you I have no paint or photoshop on this pc. The posts column will extend depending upon the length of your post. I looked at your "Get Free Loan Quotes..." post and the post footer is much lower down than the end of the left sidebar. There will be two lines containing 'HTML7'. In one line change it to 'HTML70' and save template. I followed your instructions to make left sidebar. I got one problem. I want to set all background color as #666666, but the left sidebar showed white color below the Adsense. I tried to clear the cache. It didn't work. 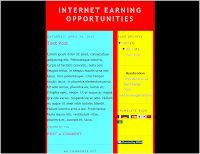 Could you help me to have a look at my blogsite "http://pfge-pfge.blogspot.com/"? Thanks. Customize the code for the Adsense widget after login to your account at Adsense site. Then paste adsense code in a Html gadget. My new third column appears at the top of my blog, just under the header. I've redone your process three times, step-by-step and don't know what else to try. If you look at my blog, the two empty widgets you added will not show up, of course, but you will see the space where the post column has moved to the left. Anything I put in the empty widgets show up at the top. What do I need to do to move this new column over to the left where it belongs? Thank you for your help! Can you send me the template? The email address is in middle column. Hey! Can you teach us how to create a common header for the two side bars? Please give more details. Perhaps the link of a page where you saw this will help. i managed to set up the three columns on my blog and added a post yesterday and moved stuff around in the page elements. When I clicked preview in the page elemenets everything was there including my post form the 16th Ocotber. However i have opened my blog this morning it and it is still the old template displaying and no new post from the 16th October. However I logged back in and when into the elements page and clicked preview and could see the three column tempalte with the post from the 16th. I finally got the third column but for some reason everything in the new column is yellow?? I tried refreshing the cache like you told someone else but it didn't work. Do you have any other suggestions? I am not seeing a third column at all right now! Maybe you removed it? i can send you my template, if u want. i tried everything but nothing seems to work out. One easy method is to go to Layout---->Pick New Template and choose a Stretch template and save. I have managed to add two columns so now I have a four column blogg (in Swedish). One column is just for the design. I will give you cred when I´m done, be so sure. Thanks for the easy instructions! I was about to give up when I found your blog. First off, thank you! This worked wonderfully. I've been fiddling around and everything looks great, but the only problem I have is that the pictures I put on my right sidebar come out smaller than the ones I put on the right, despite the fact that I've set their widths to the same size and the pictures are resizing to the same width as well. Do you have any idea what's up and how to fix it? At the moment I do not see any pictures in your blog! I guess I'm keeping you busy, huh? Recently, using code from another site (before finding yours!) I made my 3 column template wider, and put the post section on the far left. It looks right on my wide screen laptop, my 19" screen, and a smaller 15" screen in both FF and IE. On my friends widescreen 19" screen it didn't look right. The middle sidebar column went under the far right sidebar column, in IE. Can I make it fluid? should i backtrack and remove the other code and use yours? or? I also have a problem with the page element screen and scrollbars- i read your post on that, but can't use it because i didn't use your directions making my template wider in the first place. The most frequent reason for one sidebar dropping is that the total width (outer-wrapper) is less than the sum of all the column widths padding and margins! The second most frequent reason is that a div tag is not closed. If you want a three column Fluid template click here. Hi Vin, I don't remember how I surfed into your wonderful website but I remember thinking what an amazing service you provide! I've finally found a template that has everything I want which includes 2 sidebars - one on each side. I read through each comment to find a solution to my problem but didn't see one. I followed your instructions, but the second sidebar wont's go the left (same problem like Thanos I think, only a big space between the right sidebar and the postingarea). When I put in the HTM code for the second sidebar and I give it a different color or a border, this doesn't show either. Since it is a Custom template request the template designer. Basically in the <body> section the code for the posts section should come first and then the code for the sidebars. Also the columns should be floated to the left. Experiment with this template on a test blog before working on the main blog. Experiment on a test blog first. What is your test blog address? Thanks, but I already got it !! I am unable to change the colour on the new column that i have made. Any suggestions on how to get round this problem. Have a look at How to Customize the Blogger Template? I followed your instructions but found that the new column is on the right of my "posts" section instead of the left as I wanted it to be. "Sorry, the blog you were looking for does not exist. However, the name mjengakenga is available to register! " It is better if the posts column is to the left as it is the first to be crawled by the search engines. Thanks so much for this post! I'm new to blogging and I am, slowly but surely, trying to get my blog to look the way I see it in my mind. Thanks to you, I now have a left side bar. I was trying to figure out how to do this and then I found this post. Your blog is a great reference guide! Thanks again! Have a look at Why the sidebar keeps falling down? Do a CTRL+F (Edit----->Find) from browser menu. Where in between am I supposed to add this code? I've tried several different places.....?? You can add the CSS part of the code anywhere between the two skin tags. I've tried entering left for startside....nothing seems to work?? and also replace all 'startSide' in template code box with 'left'. Thank you for this post. It was immensely helpful. Hi, I'm having problems with the three column template. Please tell me what I'm doing wrong. Do it on a test blog first. When you have all the steps correct repeat on Main blog. Give temporary borders to your columns to see their limits exactly. Then increase the padding or margin numbers in the CSS part of the template. Increase the width of the outer wrapper by same amount to fit the increase in padding or margin. This is absolutely amazing-- I can't thank you enough! You made this so easy. Even learning the most basic codes and how to use them makes me extremely happy. Thank you for allowing me to expand my creativity. Do it on a test blog first. Then when you are successful simply download the template and upload it to your main blog. I recently added a third column to my blog. I have created another blog for practice purpose and again created a third column. But I just realized my first set of instructions were not from your site. Both methods worked, but I find your site is easiest to understand. I am going to try and overwrite the current instructions in my keeper blog with yours. I have yet another question, but I need to get this done first. Look in your template for the line having 'leftSide' and delete it. Can we modify the templates (directly in HTML as described here) that Blogger has and still have Layout page elements? Above instructions are for Layout Templates. Your site is a wealth of info. I have tried messing with virtually anything that I could think of, but I cannot get this three column thing to work. Left column is good, middle column is good. Right Column drops below posts and footer gadget area. I have moved things around, deleted pictures, narrowed all three columns to less than the value of the total width, and nothing. Your assistance would be great. Do it in a test blog first. Give your columns temporary borders so that you can see them. I can't believe I finally succeeded at something I had been trying to do for over a year now! I'm amazed, thanks Vin! Oops, yeah... I have a wee prob though, there is no space beetween my new left sidebar and my main text space. Easy to fix??? Add temporary borders to the columns and then play around with the padding numbers for the columns. Invalid variable declaration in page skin:Variable is used but not define.Input:startside. When you get that error message do a Ctrl+F in the template code box and look for 'Input:startside' and delete it. Thank you so much! I spent all day revamping my blog. I never could have done it without your simple instructions. First, is there anyways to make the columns (especially the one on the right) further away from my main column? Right now I feel like the writing almost looks like it runs into each other. Second, any suggestions for free programs that make great headers!? You have to experiment with the margin and/or padding settings in the CSS code. You can make a header in any free image editing program like GIMP, Paint, Irfanview etc. Just Google for them. I've tried for three hours now to change my blog to three columns. I've succeeded in making the margins bigger to add room for a third column, but when I view it in Layout, the Add a Gadget is under the header. Please advise, and thanks in advance!! First change the sidebar code to float:left. Secondly in the <body> part of the code add the code for the sidebar BEFORE the code for the POSTS COLUMN. Thanks for your directions for adding a third column! I used them to successfully add a third column. However, I have a few problems. First of all, all three columns only fill about 2/3 of the space. How can I make it wider so it fills the whole screen? Also, there is not space between my first two columns and I'd like the two to be separated at least a little. I'd really appreciate your help. Thanks!! 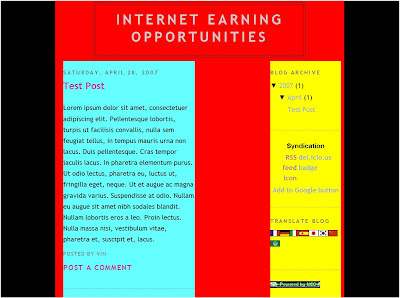 Check out How to Increase blog width?Increase the left-margin or left-padding of the columns to separate them. Practice on a test blog first. Give borders to columns so you can see them clearly. Thanks for all the info. Your instructions are clear and easy to follow, but I'm getting an error message after the paste in of step three. More than one section was found with id: sidebar2. Section IDs should be unique. and in it change '2' to '3'. Completely Right. You have great skill. I tried to add a right side column for the Scribe template, but the code was a little different than in your 3 step desription. Is there a different approach to use for this template, or am I just missing something? Exactly what code did you change and to what? I don't know what I'm doing please help. I'm a complete novice at all this, and you've already been an incredible wealth of info - your tips for expandable posts are fantastic - so thanks, retroactively, for that. The three columns show up great on my page elements, but on my test blog (junkyardblues.blogspot.com) the postings graph continues to show up far-left column, with empty space in the middle. I went through your steps a few times, and still no joy (also tried clearing cache and was bamboozled by the Fluid width three-column template). Any help in getting for getting my postings to display center column would be appreciated. Thanks so much for all the good info you have on this site. I happily have added a third column to my blog. Thanks to you and those who added comments. It all helped. That's what i was looking for. I will definitely share it with others.Thanks and keep up the good work!